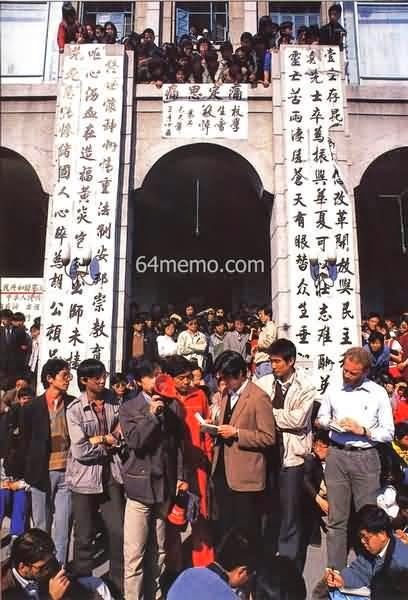 Peking University Preparatory Committee press conference on May 1, 1989. 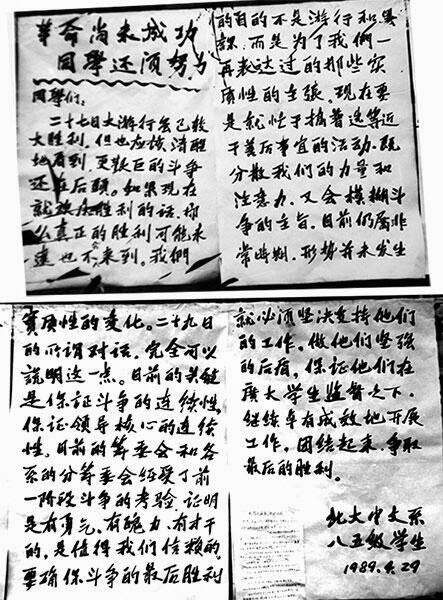 Wang Dan is reading from prepared text. 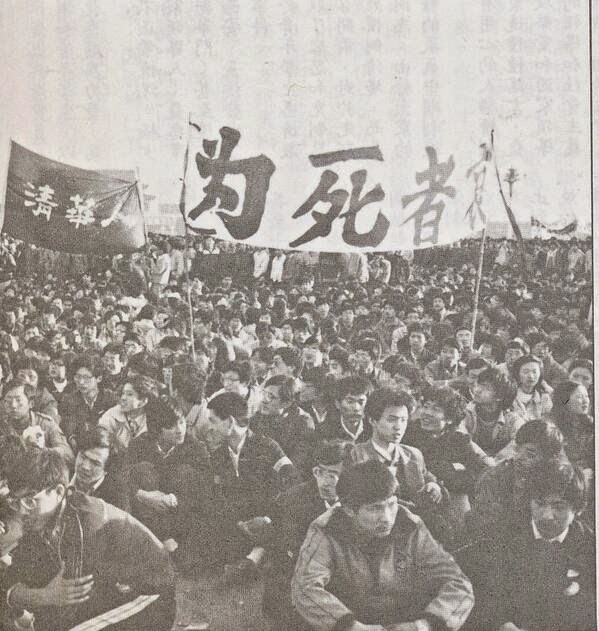 The one with red shirt in lower left corner is Kong Qingdong. 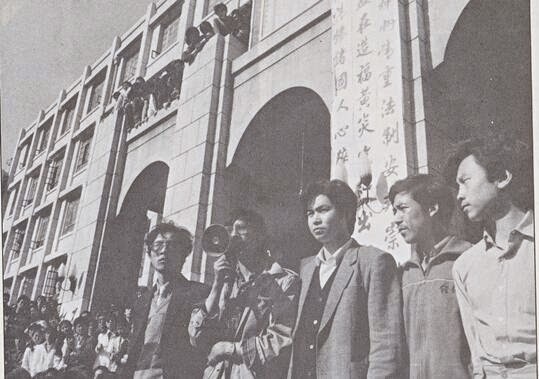 Yuan Mu and other leaders meet student representatives. 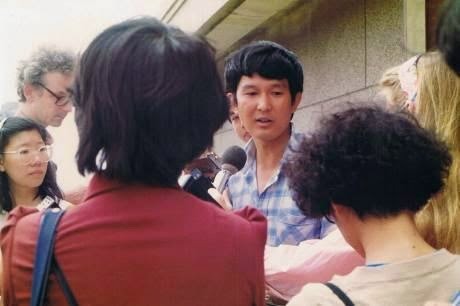 Xiang Xiaoji talks to reporters after existing the dialog in protest. 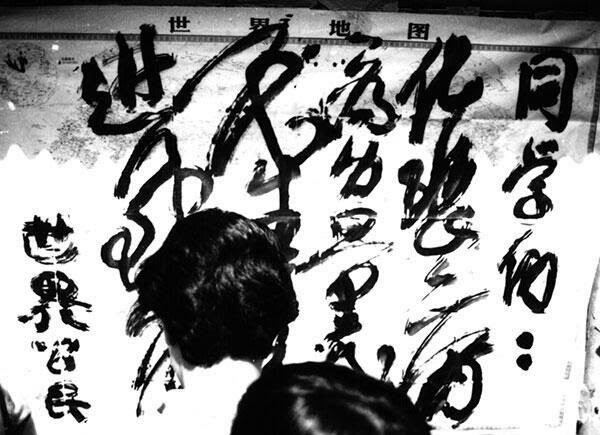 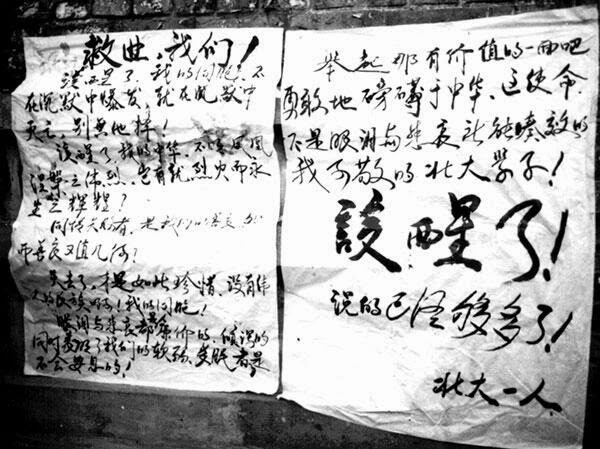 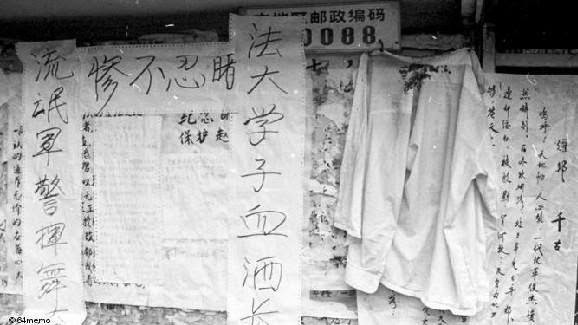 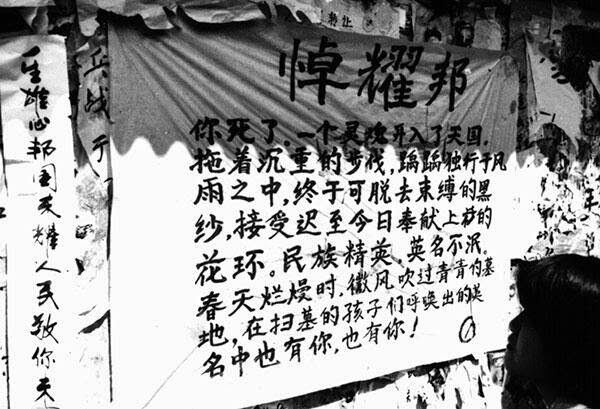 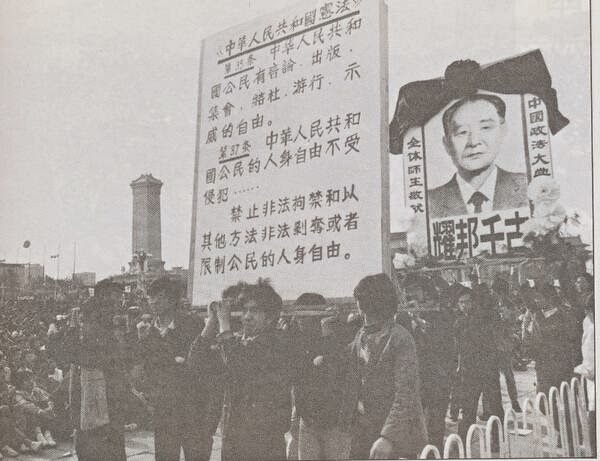 One of the big posters in Peking University on April 29, 1989. 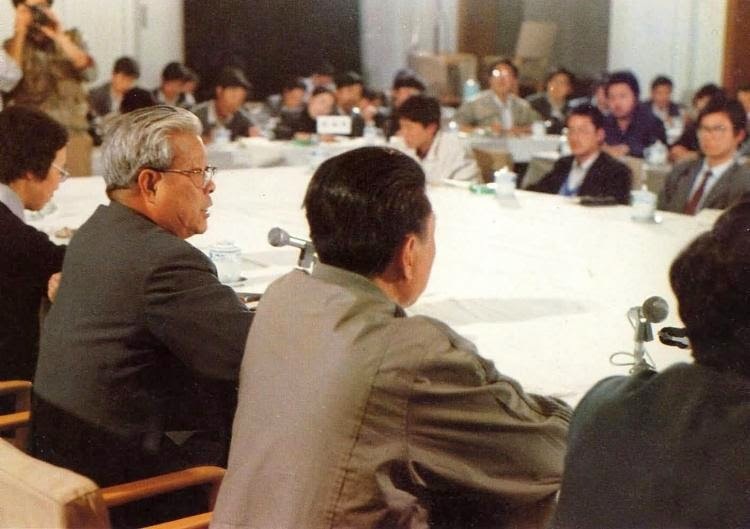 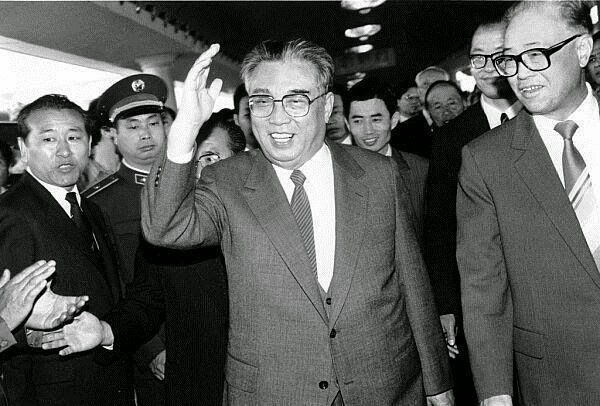 In the evening of April 28, 1989, Wang Dan (far left) and Wuer Kaixi held a press conference. 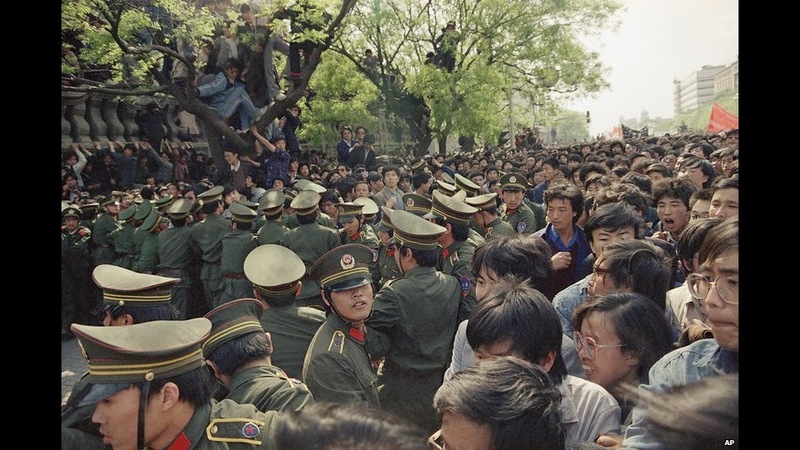 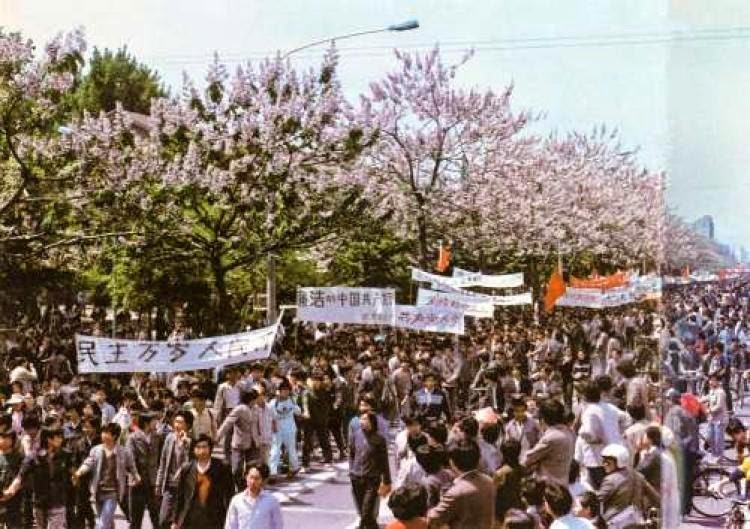 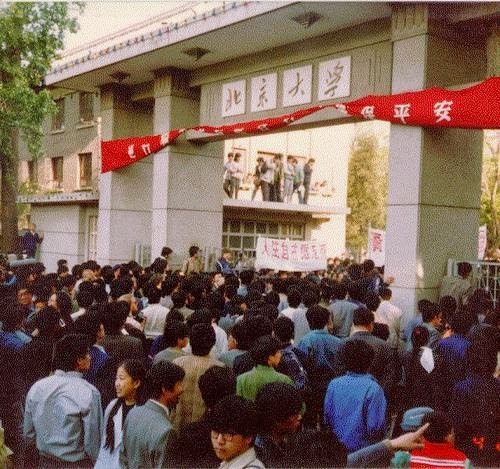 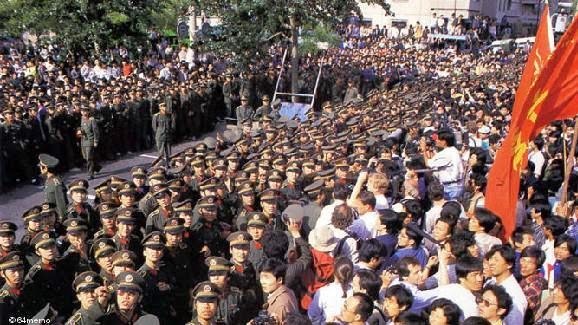 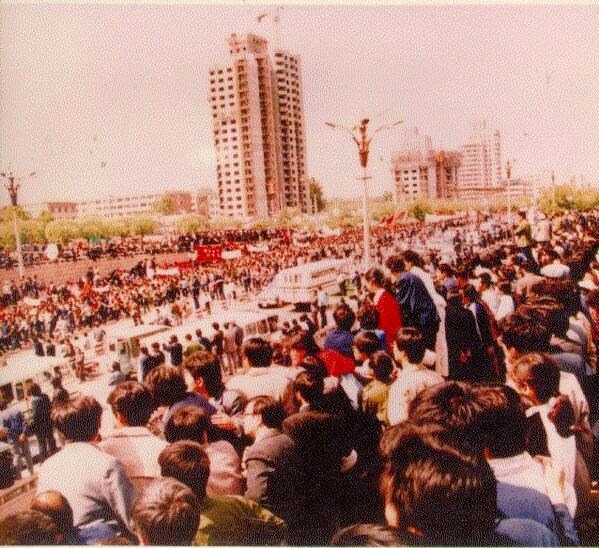 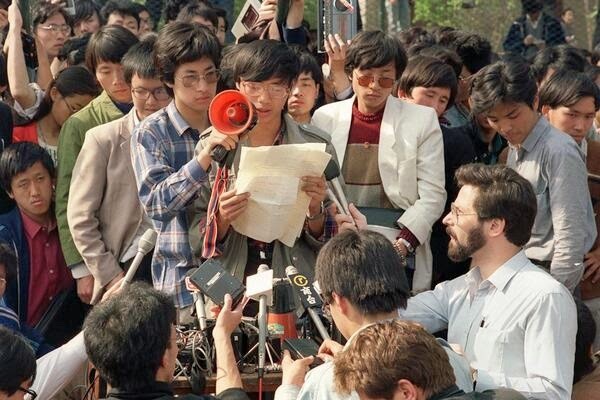 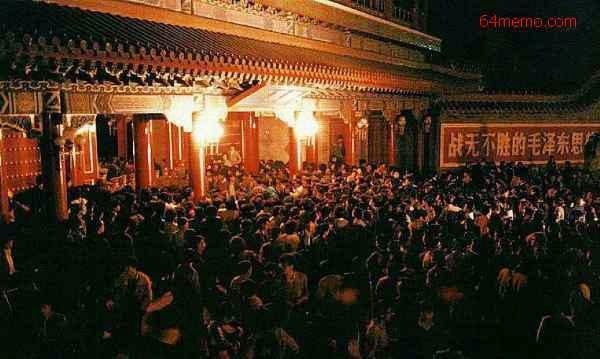 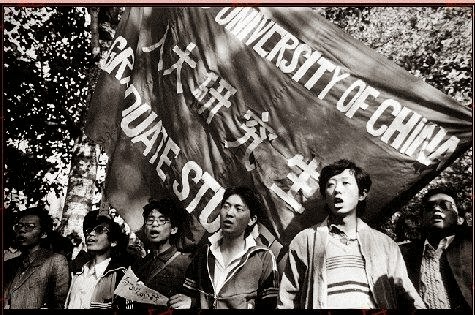 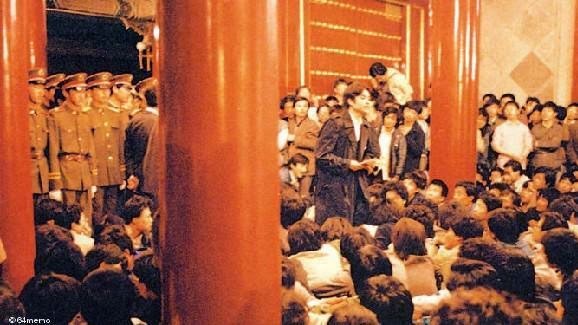 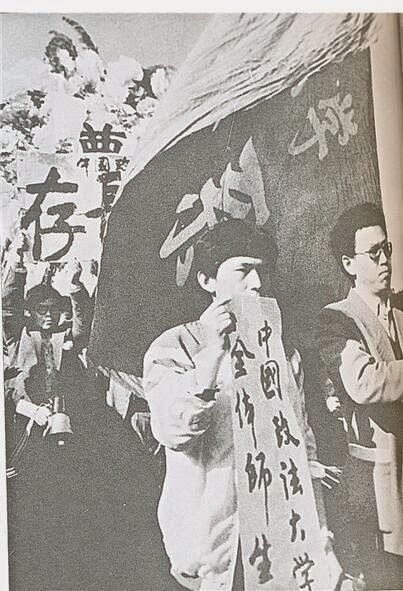 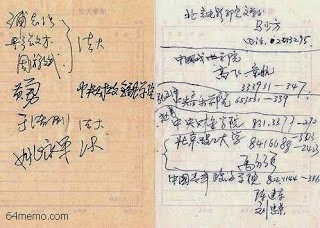 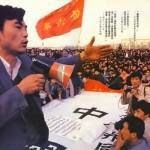 In the morning of April 27, 1989, people gathered in front of Peking University to see if students demonstrate this day. 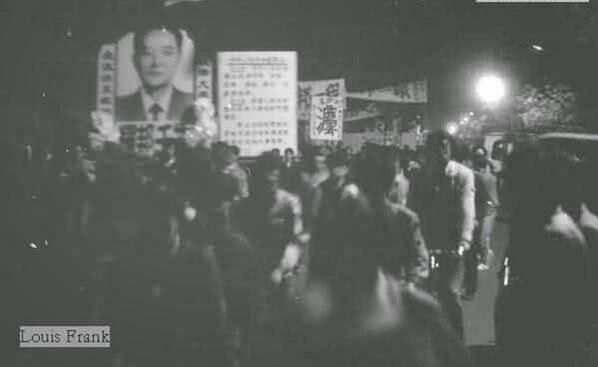 Students of Peking University march toward the gate. 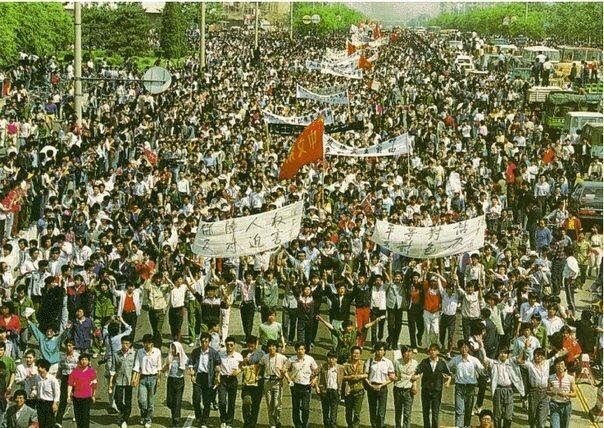 Student formation outside of campus. 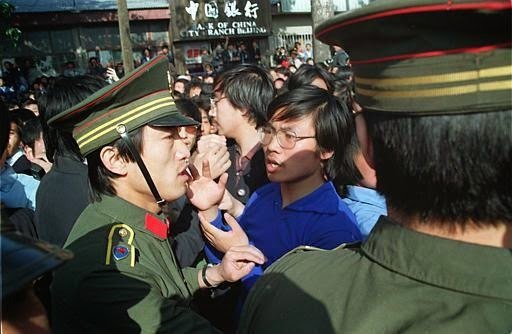 Police forms one of the human barriers trying to stop the march. 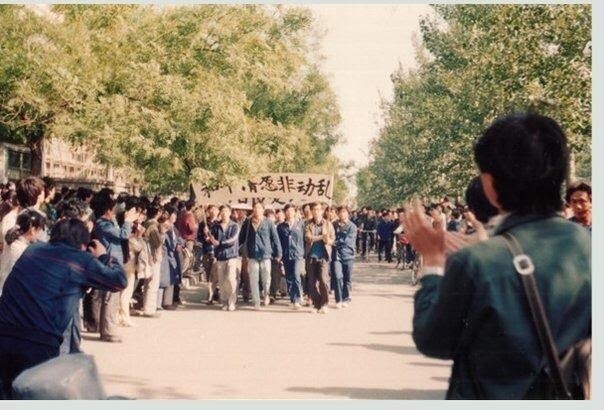 Marching students meet up against policy barriers. 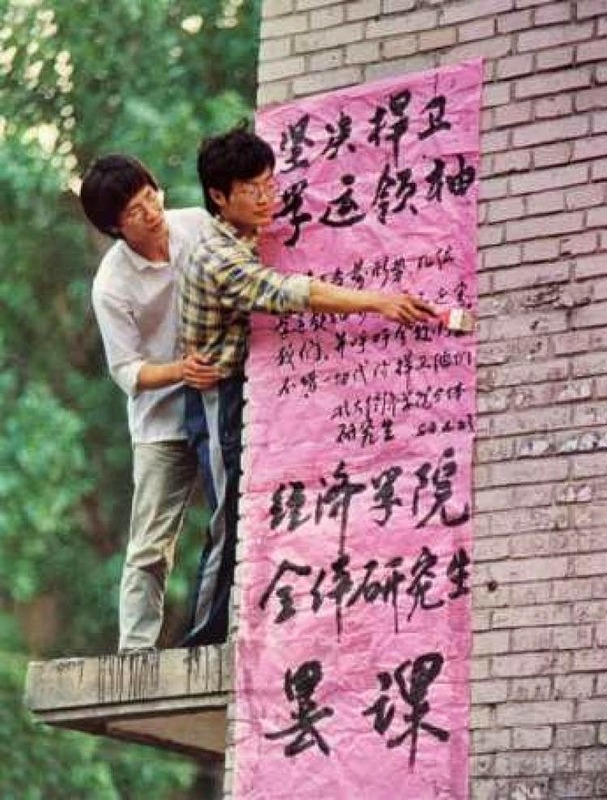 Students push through policy barrier. 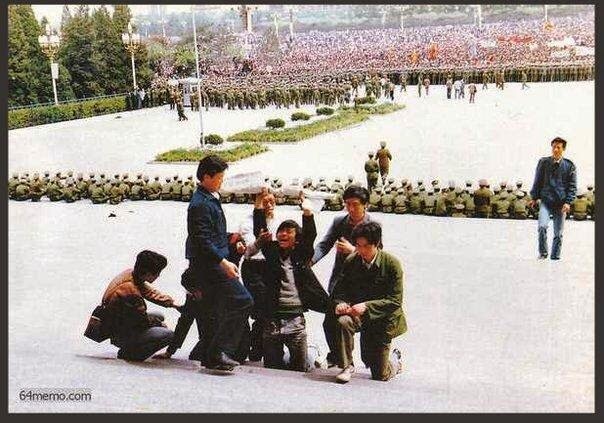 At Tiananmen Square, soldiers of the 38th Army are moving into positions. 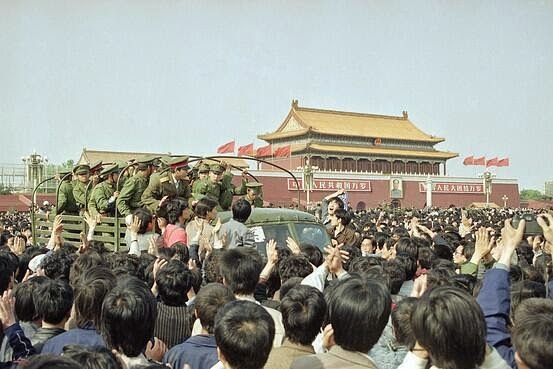 People cheer as police withdraw from Tiananmen. 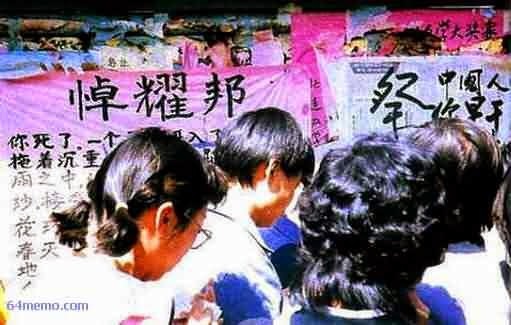 On April 29, 1989, students use poster to recount the great demonstration and celebrate. 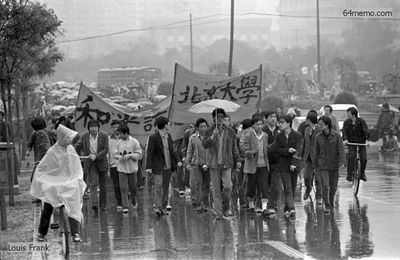 Students from the University of Politics and Law enters Tiananmen Square. 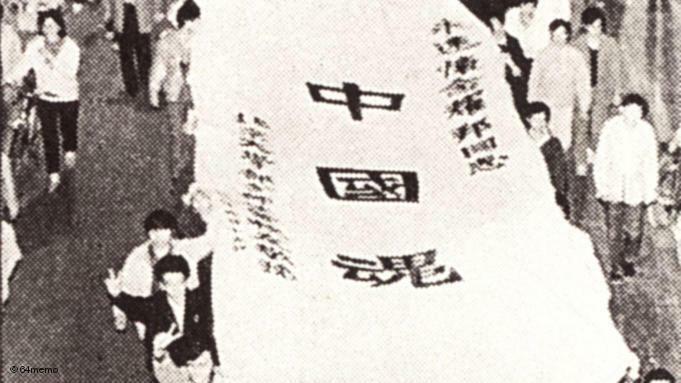 Students from the University of Politics and Law. 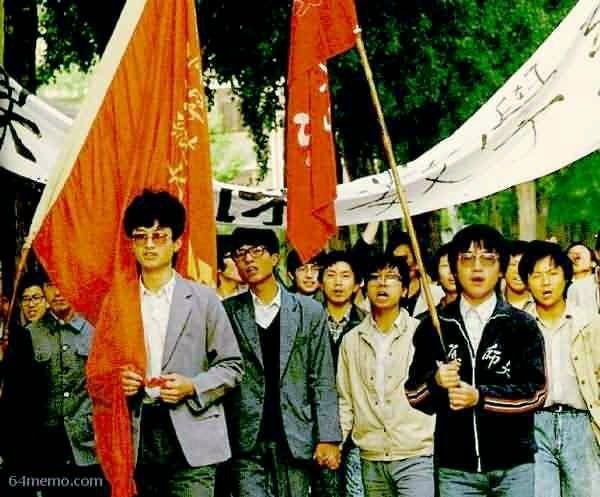 The tall one by the red flag in back row is Pu Zhiqiang. 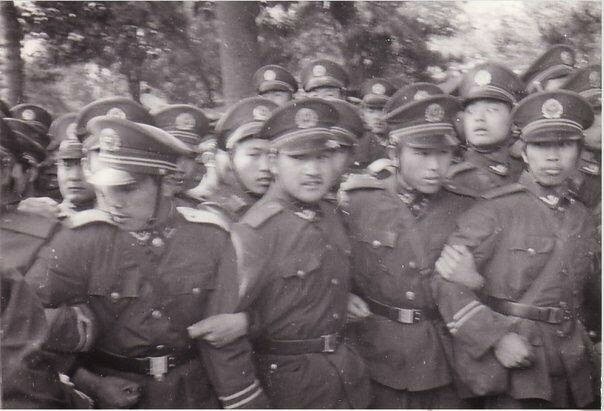 The one wearing a black sleeve band in front is Wu Renhua. 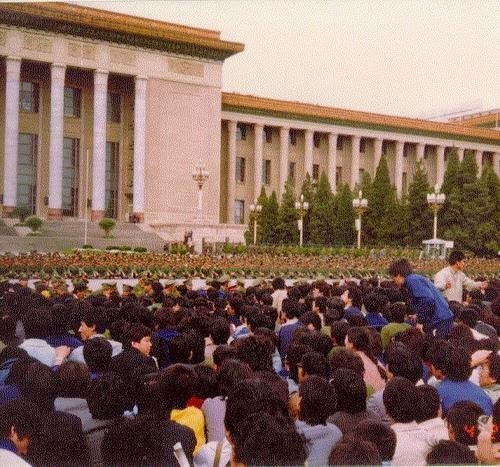 Students sit down in front of the Great Hall of People waiting for the funeral, under the watchful eyes of police. 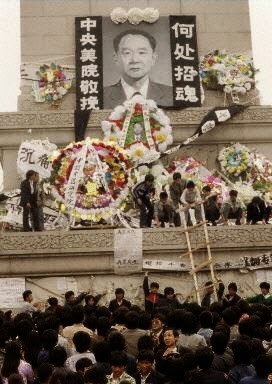 Students from Tsinghua University wait for the funeral. 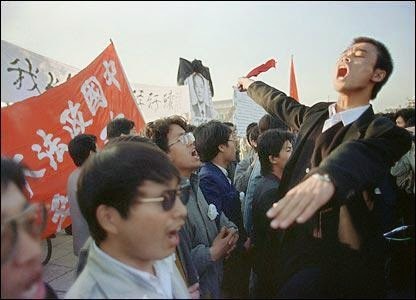 Students from University of Politics and Law sing patriotic songs. 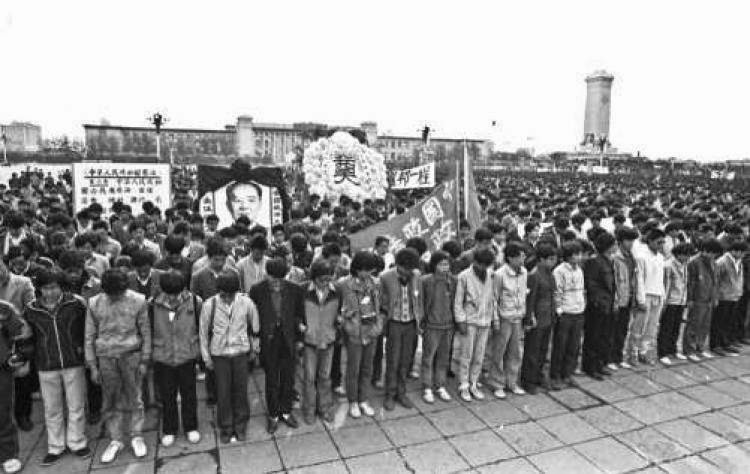 Students in the Square observe a moment of silence at the start of the funeral. 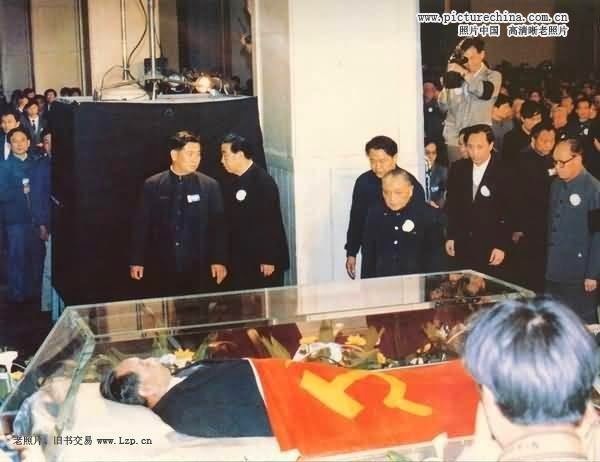 At the funeral inside of the Great Hall of People, leaders pay last respect to Hu Yaobang's body. 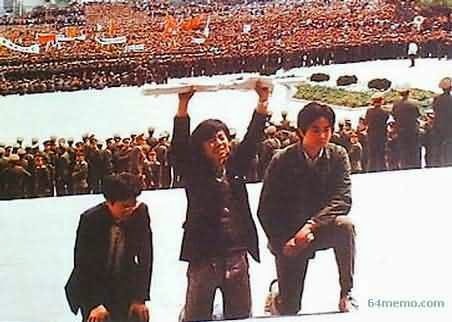 Students Zhang Zhiyong, Guo Haifeng, and Zhou Yongjun (from left to right) kneel down with their petition. 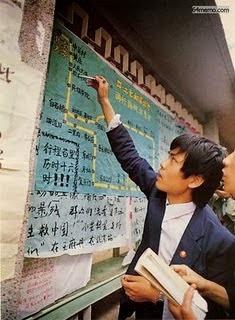 Other students persuade the kneeling three to give up the petition. 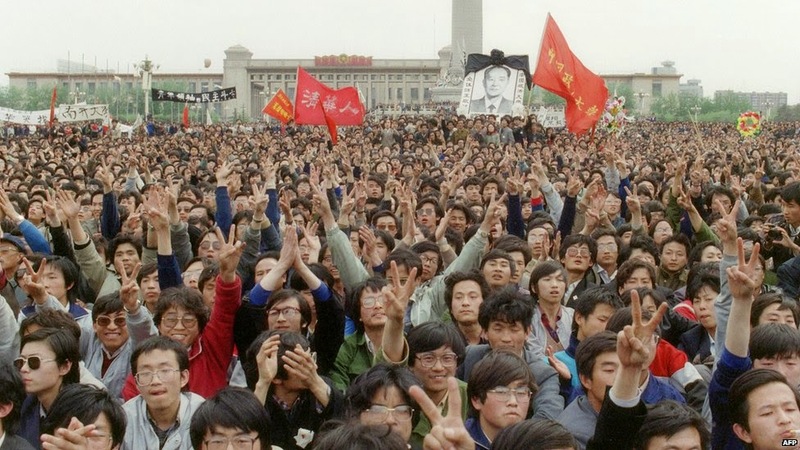 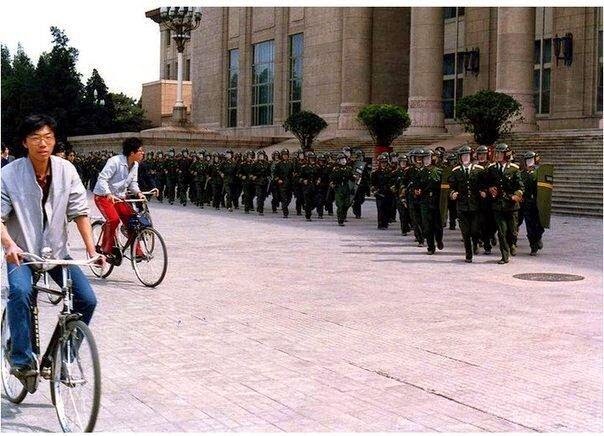 On the night of April 21, 1989, students march into Tiananmen Square for the funeral next day. 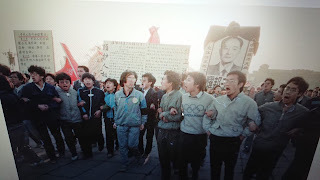 The photos were taken on April 16, 2015. 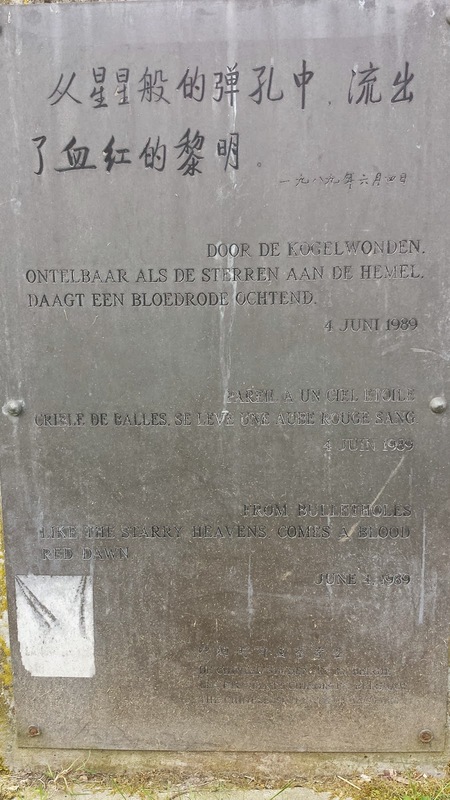 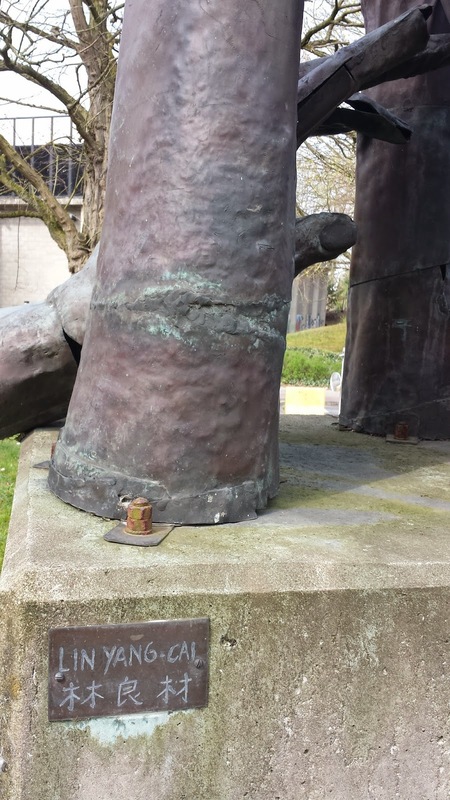 A small tablet on the base of the sculpture indicates that the author is Lin Yang-Cai, a Tiawanese artist who was studying at Brussles at the time. 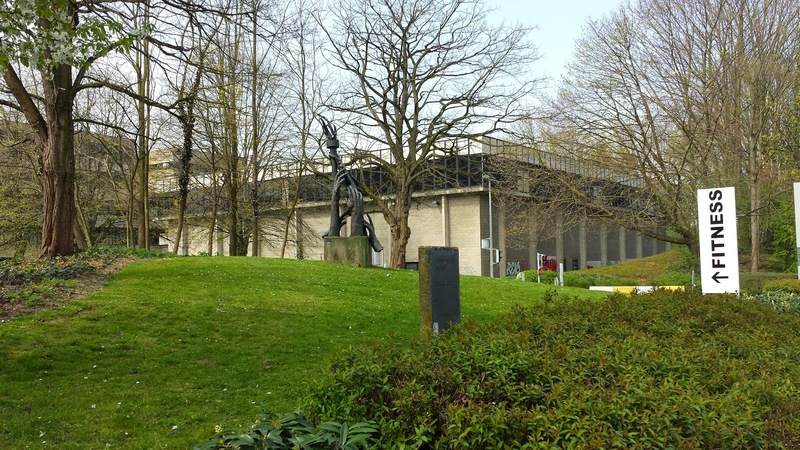 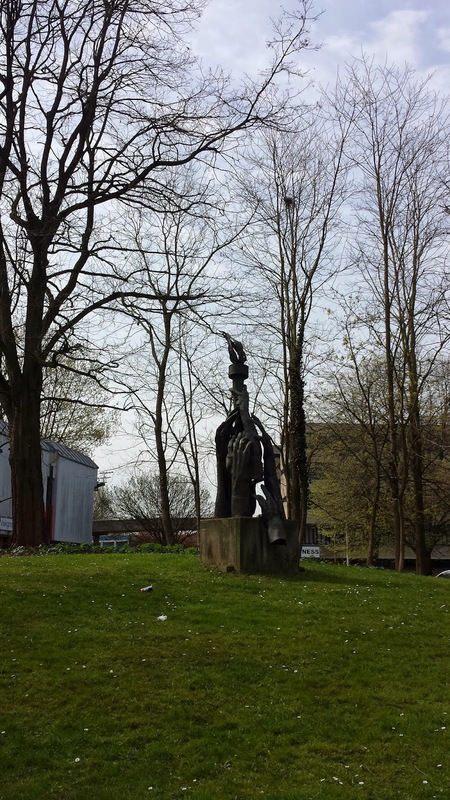 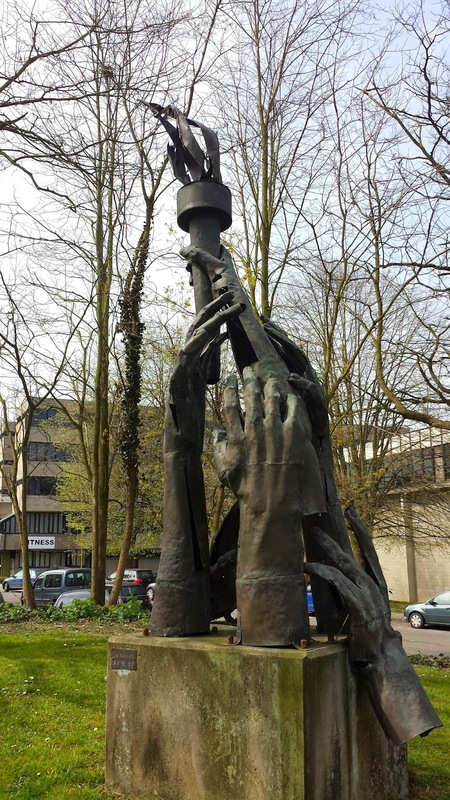 It is unknown when the sculpture was actually produced.